The Do-It-Yourself Modular Metal Building Kits are available with widths (36 ft), length (36 ft with 12 ft bays) and side walls (10 and 12 ft) dimensions. The units are constructed with 14GA steel with 26GA sheeted covering. They are designed to withstand snow load (40lbs – Roof) and wind load (110 mph). These buildings can be customized with options such as man doors, windows, RCA roof and 12 ft eve height. 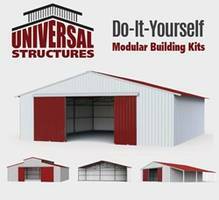 MD Barnmaster announces a new line of products under the brand name Universal Structures that provides pre-engineered modular building kits specifically for DIY home and business owners. ONTARIO, CALIF. (PRWEB) AUGUST 21, 2018 - MD Barnmaster (MDB), an industry leader in the design, manufacturing and installation of custom, pre-engineered modular barns, buildings, professional equestrian and agricultural facilities, is excited to announce their new Universal Structures brand line of DIY building kits specifically for the do-it-yourself home and business owner. Universal Structures is a US-based company that designs and sells ready-to-assemble building kits including modular buildings kits, modular horse barns, permanent and temporary horse stall kits and building accessories. All the standard building kits offer modular add-on options allowing the end user to build a barn or building that meets their current needs as well as future additions. An optional Solar Light Kit is also available for these building kits, or for any other building, as a cost effective primary lighting source when electric service isn’t available. Examples include horse barns, outback buildings and off-grid living. The Solar Light kit also serves as backup emergency lighting in the event of a power loss for wired buildings. “We are excited to launch the Universal Structures product line” said John Stacy, MD Barnmaster’s Director of Marketing. “We saw a need to provide DIY home and business owners with affordable building kit options that are far superior in durability than the thin metal buildings on the market. We’re offering a cost-friendly solution to consumers who want to build their own barns or buildings without sacrificing construction technology. MD Barnmaster has been America’s top modular barn and equestrian facility builder for over 40 years. Using tough, durable 26 gauge steel roofing, and 14 gauge, galvanized steel on structural parts, you can rest assured you have a durable, heavy wind and snow load safe structure that will last for many years to come.” John said. The Universal Structures DIY concept starts with the idea of providing building kit products that are durable and affordable. Backed by MD Barnmasters more than 40 years experience in the pre-engineered barn and building industry, Universal Structures has done all the hard work for you. Each kit is pre-engineered with stringent quality control measures in their own manufacturing facility to ensure all the components are precisely cut for easy assembly. The modular versatility allows easy add-ons, or can be disassembled and moved, or even re-sold. Established in 1975 by horsemen wanting to build better barns, MD Barnmaster is a leader in providing innovative, pre-engineered modular barns, equestrian facilities and buildings. The company has spent over 40 years perfecting its product to create better barns that are safer, durable and affordable. MD Barnmaster barns & buildings feature lifetime kick-proof, chew-proof warranties, and wall/stall panels that feature 0% fire spread rating. See https://mdbarnmaster.com to learn more.